In recent times, we discussed a lot about one of the most important and basic strategies in chess – attack. We learnt about the most important attacking principles, biggest problems in attack and the basic conditions for a successful attack. However, some of you might not be able to understand the art of attack completely. Maybe these three lessons might not be enough for you to crush your opponent’s king. Indeed, it’s not impossible to teach everything about attack in a couple of lessons. What’s about “Crushing the King”? As you may already know, attack is an art that every chess player should master. Without an attack, you cannot win a single chess game. We’ve put our best foot forward in order to create a comprehensive attacking course. After the study of this course, you will have all the necessary abilities and understanding in order to start a successful attack against your opponent of any level! First, let me remind you of the amazing special offers we’ve provided you with to celebrate the launch of the course “Winning the Middlegame”. There is a huge 30% discount on the course, which will be valid until Sunday, 21 August. Just use the coupon “middlegame” and that will save you about 36 USD! If you don’t know how to use a discount code, please see here. Another great offer is that the first 150 buyers of the course will get my premium video “How to win a won game?” completely FREE! We’ve already made more than 100 sales and we’re about to hit the 150 mark and there are only a few more spots left – therefore, hurry up and purchase the course now to be among the first 150 buyers. You can purchase the course by going to our launch page here. Moreover, you can purchase the “combo offer” – get “Winning the Middlegame” and “Your Winning Plan” together for just $149 instead of the normal total price of $178 – you will save a huge 29 USD! Enhance your winning skills and improve your overall strategic understanding with these two courses. Visit the launch page here and you will see this offer after clicking “Order now”. If you are wondering about the quality of my courses and might have any ’trust issues’, I’d say that’s very common. Indeed, there are lots of tutorials and courses out there but not all of them are of sufficient quality to help you IMPROVE YOUR game. Some of our students have shared their feedback about our courses with us (and you can find a lot of this here), which is really helpful for chess players who have never heard of us or those who are not sure about the quality of our paid products, as I said above. That’s why, today, I’d like to share a review by someone special, GM Jaan Ehlvest! Jaan Ehlvest is an Estonian chess player who was awarded the title of Grandmaster by FIDE in 1987 and named Estonian sportsman of the year in 1987 and 1989. Since 2006, he has represented the United States. He was briefly a world top-10 player when, in 1991, he ascended to the number 5 slot on FIDE’s official list with an ELO rating of 2650. Recently, he studied my premium video “My Thinking System“, then wrote a review of it and also spoke about my teaching methods. I’m overwhelmed by his message and am very happy to share it with you. My name is Jaan Ehlvest. I was one of the top tournament players during 1988 till 1991 when I finished the World Cup tournament series only behind Kasparov, Karpov and Salov. Nowadays I am a devoted chess coach. I am one of a very few former elite or todays GMs who have a degree from college. I studied psychology and because of that I was very keen to listen to Igor Smirnov’s webinar about how to think in chess. Igor is not the first who has tried to find a simple algorithm for novice players to help them think like a Grandmaster. Soviet GM Kotov wrote a book a long time ago “Think like a grandmaster”. Other authors like Silman are also trying to cover this subject. Usually they have too serious a theoretical background which is difficult to apply in practice. Talking about Smirnov’s concept – it is more practical. I like that he has a lot of examples from practical games. You must follow the best brains, if you are talking about the decision making process in chess. Igor gives good examples using unconsciously the induction and deduction method in chess. The material is presented in a logical hierarchy and must be easy to understand for both the very beginners and the advanced players. Igor however is warning the audience that this is only the beginning. Which is the case in chess, as you need long hours to study even a simple concept. I myself used some of the materials presented by Igor on Youtube and I was a very satisfied costumer. He covers the subject thoroughly from start to finish. This is probably his only weakness, because I think the webinar should be shorter, like one hour. I would recommend this webinar to serious chess aficionados and I am waiting the follow up of this subject. Thank you very much, Jaan, for your warm words and detailed review! I believe that this review by a former world number 5 player about my courses and teaching methods is very useful for everyone and specially for students who haven’t bought any of my courses yet and still have many doubts about them. Therefore, I strongly recommend you to study my course “Winning the Middlegame”, which contains a single system of how you should play the middlegame – and lots more. You can go to the launch page here and grab the course with amazing offers! In order to address these requests, we are considering splitting “The GM’s Openings Laboratory – 2” course into separate openings, thereby making it possible for you to purchase any particular opening for a relatively small price. In order to improve it further, we’ll record the additional video lessons explaining each opening. Feel free to let me know if you like this idea (you may write your comments below). Therefore, our new opening course “Bogo-Indian Defense” is being released today! 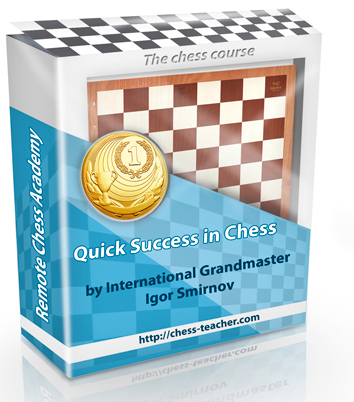 The author of this course is our guest coach GM Levan Aroshidze. The Bogo-Indian is a solid and positionally sound opening. It can be used against both weaker opponents (whose positional understanding is lacking) and against strong rivals (because it gives you a very solid position). Hence, you can be ready to go in for the fight! If you are among them, accept my congratulations because you’ll get a massive 50% discount on the course the “Bogo-Indian Defense”! We’ll contact the students who already bought the course “GM’s Opening Lab – 2″, shortly and provide them with the 50% discount! Improve your thinking process with the best chess courses! Garry Kasparov is presenting the 1st prize to Igor Smirnov "Kasparov's Cup-2009"
Download now your FREE chess course! 1998 – «Independence-Cup’98» (B) – 2nd place. 2000 – Championship of Crimea – 1st place. 2000 – International tournament турнир «Alushta-2000» – 2nd place. 2001 – Championship of Ukraine (juniors) – 3rd place. 2002 – Championship of Ukraine (juniors) – 1st place. 2002 – International tournament “Sevastopol-2002” – 1st place. 2002 – European Team Championship – 3rd place. 2003 – World youth chess Olympiad – 2nd place. 2003 – Team Europe championship u18 – 3rd place (personal). 2003 – Clubs Arabic Championship – 4th place. 2004 – “2nd youth sport championship of Ukraine” – 1-2 place. 2005 – Championship of Ukraine (s\f) – 1st place. 2005 – «International tournament Czech-open» (J) – 1st place. 2005 – «Czech-open» (juniors) – 2nd place. 2006 – International masters tournament “Amman-2006” – 2nd place. 2007 – International chess tournament «Ilichevsk-2007» – 1st place. 2007 – «Memorial of E. Geller» (youth) – 1st place. 2008 – “Memorial of E. Geller” – 3rd place. 2009 – “Kasparov’s Cup” – 1st place. 2003 – Title of International Master. 2008 – Title of International Grandmaster. 1997-2004 – learning in the Sevastopol Sport School. Awarded the chess trainer certificate. 2005 – onwards chess coach. 2009 – Got a Master’s degree in psychology. checkmate64. Simple theme. Powered by Blogger.